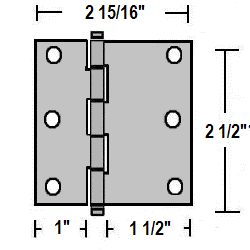 Order Long Leaf Shutter Hinge (2 1/2" x 1 1/2"). 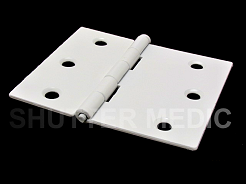 These long leaf hinges are used to increase throw-out of shutter panel and clear obstacles such as high relief window moulding. This hinge is 2 1/2" tall. One leaf is 1 1/2" wide and the other is 1" wide. Hinge contains a loose pin that can be removed. The hinges I ordered arrived promptly, were well packaged and met all of the details described on the web site. I'm pleased with the product and it made my plantation shutter project go much more smoothly. Local hardware specialists and locksmiths were unclear if a different leaf size hinge was available. As usual, I was forced to do my own research. In most cases, rudeness and stupidity prevail in the retail domain. I found Dr. Patrick and his interns online. Patient is healed. P.S. Twelve inexpensive hinges on a $10,000.00 project. Who knew?